by Dr. Thomas J Stanley, William D Danko, Ph.D.
New. 100% Money Back Guarantee. Brand New, Perfect Condition. We offer expedited shipping to all US locations. Over 3, 000, 000 happy customers. Sewn binding. Paper over boards. 272 p.
Fine. 100% Money Back Guarantee. Brand New, Perfect Condition. We offer expedited shipping to all US locations. Over 3, 000, 000 happy customers. Sewn binding. Paper over boards. 272 p.
Book came quickly and securely packaged. It was in better shape than I thought it would be. I heartily endorse this seller for others to trust. 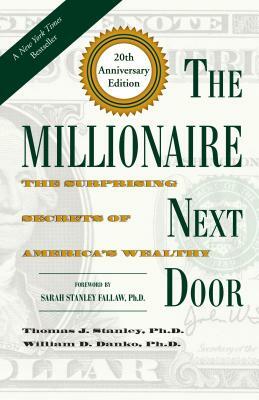 This is not a book for millionaires, but on how your lifestyle shape your wealth. If you live within your means, and in a basic lifestyle of make, save and invest, you will never have any fiancial problems in your life. Very simple. Good reading and examples. I love this book. It illustrates in detail what future millionaires do differently in life. Unintentionally it also illustrates that you could miss your entire life while piling up millions. Remember: Your last jacket does not have any pockets. Convinced me that I definitely do not want to be a millionaire. this book was life changing for me. After growing up with a family that never knew how to save money. I wanted to educate myself on how to have control of my financial future. This book taught me so many wonderful principles. It also taught me that your neighbor that looks like they are wealthy may be up to their eyeballs in debt. Very important book in my life.